The Escanaba & Lake Superior dates back to the North Ludington Company, a sawmill/lumber enterprise founded by Jefferson Sinclair, Daniel Wells, and the Ludington brothers (Harrison and Nelson) in the mid-19th century. This mill was located near Wells, Michigan on the banks of the Green Bay (part of Lake Michigan) and around 1850, Isaac Stephenson became part of owner of the business. By this point Stephenson was already a successful businessman in the lumber industry and by 1888 owned so much of the N. Ludington Company that it was renamed as the I. Stephenson Company. With this change, a subsidiary of his business known as the Escanaba River Company constructed a seven-mile railroad between Wells and 7 miles to the west to tap nearby hardwood timber plots. On November 17, 1898 the railroad became the Escanaba and Lake Superior Railway when it extended the line 19 miles to the town of Watson. Now a fully functional common-carrier railroad the E&LS continued to extend westward to reach more timber tracts, building spurs and branches along the way. By the early 20th century the railroad had reached Channing, where it interchanged with Chicago, Milwaukee & St. Paul (a railroad that would later be known as the Milwaukee Road), and operated more than 100 miles of track (including branches). Around this time, on February 12, 1900 the company was renamed as the Escanaba & Lake Superior Railroad. Now that the E&LS had connections to both Class Is Chicago & North Western and the Milwaukee Road it was able to diversify its traffic base a bit. For instance, by 1900 the E&LS was hauling Milwaukee Road ore trains to the docks at Escanaba (although this ended in 1936 when the railroad elected to use the C&NW's nearby facilities to eliminate the need of maintaining the Escanaba docks). In any event, the E&LS also operated a fairly successful passenger/mixed-train business at least until around 1950, as it acted as a bridge line between two major Class I systems. 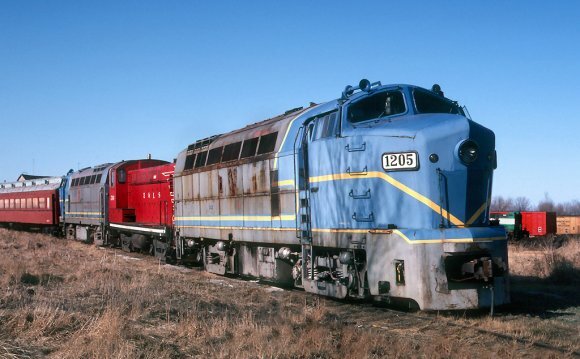 E&LS SW8 #1201 works the M&M Branch near Crivitz, Wisconsin with a short local during October of 2008. The shortline has long been unknown for taking quite long to repaint its units making for a colorful fleet of predecessor paint. This particular switcher began its career privately owned by Reserve Mining. The author notes that this branch was embargoed shortly after this photo was taken. 1kW MF/HF Transmitter. Australia Transmitter marcomsrl.es.